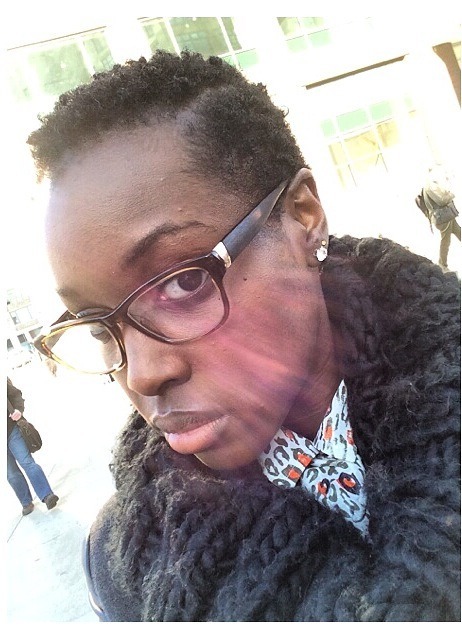 This week I’ve been experimenting with some styling products for my TWA. I’ll show how I achieved this look in a later post, but by the end of the week I had so much product build-up I couldn’t wait till wash day. I’ve dedicated Sunday nights to my hair. I look forward to (co)washing, deep conditioning and adding new ingredients and methods to my regimen. This week I added protein (egg), strength (honey) and shine (extra virgin olive oil or EVOO). I finally settled on a deep conditioner and went for the wildly popular Shea Moisture Hair Repair Masque. This stuff smells amazing! Made with pure Shea butter, sea kelp and argon oil it strengthens while repairing and promotes hair growth. Certainly not the cheapest DC on the marketing, though I do expect it to last a few months especially since I don’t have much hair to cover. In a plastic bowl I whisked one egg. I added two table spoons of EVOO and one table spoon of honey. 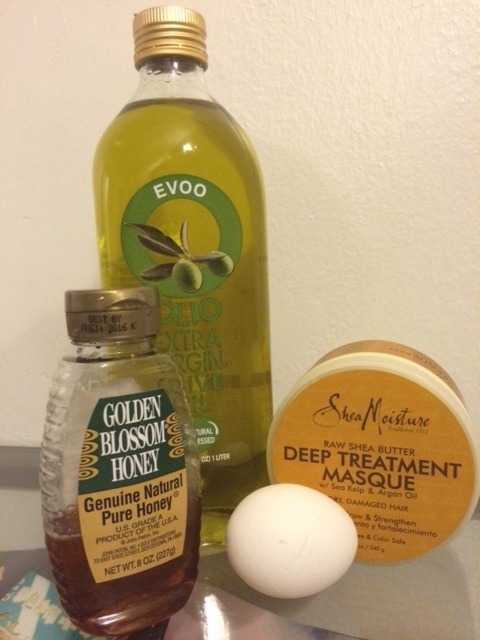 Once all the ingredients were mixed, I added three scoops of the Hair Repair Masque. Even with the added ingredients the lovely smell remained. My hair has already been (co)washed but by this time it has dried, so I used Aloe Vera juice to rewet and saturate my strands. I then poured a generous amount of my new (super!) DC on to my hands and worked that into my scalp and hair. I gave myself about a 15 minute scalp massage, my favorite part about wash day. When using a deep conditioner the best results are achieved with heat. Since I don’t have a hooded dryer I improvised by layering a plastic bag, a t-shirt, a second plastic bag and then finally my towel over my head. The heat from your body is trapped on to your head and the deep conditioner can get to work. Per the Shea Moisture instructions this should be left on for 30 minutes to an hour. I left mine on for the full hour, this head needs it! After a thorough rinse my hair felt soft, strong and was already shinning. I followed up with my homemade shea butter, jojoba and avocado oil mix. Since I used a DC I decided to skip the greenhouse method, I think I will do this towards the middle of the week to freshen up my hair. No need to throw away the left over product in your bowl. Why waste? 90% of the ingredients are natural and/or can be found in your cabinets. I placed the lid on my bowl and stored it in the fridge. In the back of course. I could just see my boyfriend sampling a big scoop of it thinking it’s a new yogurt ha!